This is a simple sewing project and they just look so cute. If you would like them to look a little fancy, pick out some coordinating ribbon, maybe 1/4 inch to 1/2 inch in width. Note: I purchased 1 yard of fabric hoping that I would be able to complete all 12 burp cloths with the same fabric. It didn’t work, because of the fabric shrinkage in the wash.
Start out by washing everything in your washing machine in HOT, don’t forget to wash the ribbon (maybe put the ribbon in a lingerie bag to keep it from getting tangled up). This will make sure that everything is preshrunk and the person you give this to won’t have to worry about how to wash them. Next, you need to measure the length of the cloth diaper. Different lots can vary so you want to measure them to make sure that you are cutting your fabric to the right size. Mine were 17 1/2 inches long. Now, determine the desired width of the panel that will go down the diaper. I liked 5 inches. You’ll need to cut your fabric piece a little bit larger than your measurements. I cut mine 18 by 6 inches. This allowed me to get the most cuts out of my fabric and allowed me to fold under a 1/2 inch on the long sides and 1/4 inch on the ends. You can create a template with paper or card stock and cut with scissors OR if you have a rotary cutter, ruler and cutting mat, you can cut much faster. If you are doing 12 of the same fabric, you can fold your material in half (selvages together), make a clean cut edge and then cut to your desired length (mine was 18 inches). Then open up your piece of cut fabric, cut off the selvages, and at one end cut your desired width (mine was 6 inches), continue cutting your desired width until you reach the other end of the fabric. I was able to get 7 panels from that first piece. Make the pinning task easy on yourself and iron your fabric first. You can use a hem gauge to ensure that you are folding under your 1/2 inch (or 1/4 inch). Once everything is ironed, finishing up goes so fast! Take one cloth diaper and your ironed fabric and line everything up. You can use your hem gauge to ensure that you are lining the fabric panel in the center. If you are using ribbon, cut it to the same length you cut your fabric and lay it out on each side. Pin the ribbon and fabric in place. Here comes the sewing part. 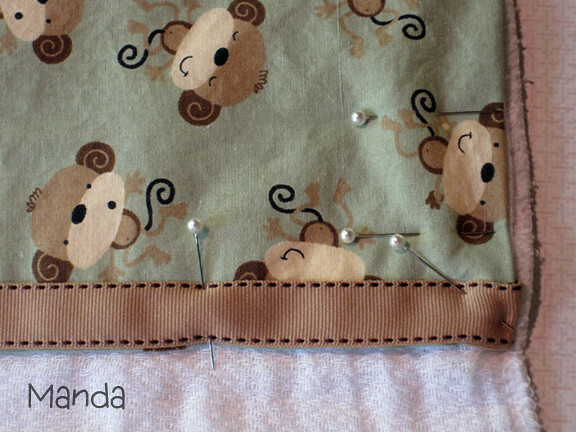 If you are using ribbon, sew a straight stitch close to the edge from top to bottom. I also back stitched just a few stitches at the beginning and end. Then, sew close to the edge of the other side of the ribbon. 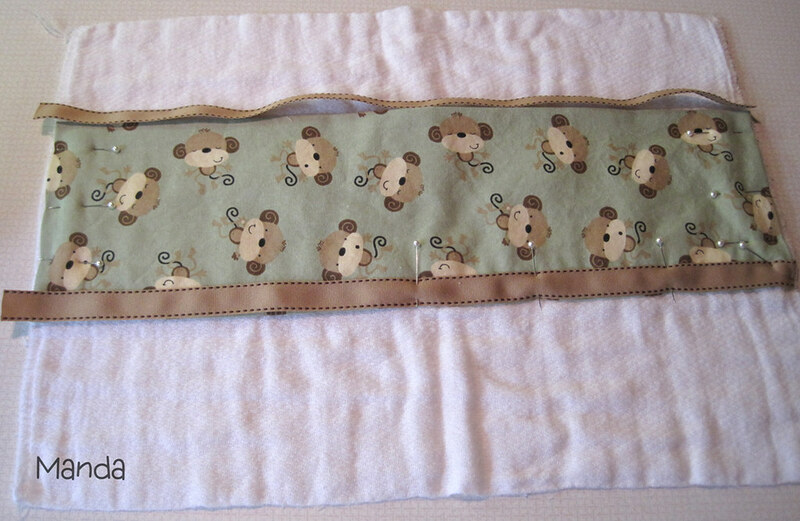 Do this for both sides of the panel and then sew a straight stitch close to the edge of the diaper on each end (making sure to back stitch at the beginning and end). If you are not using ribbon, just sew close to the edge down one side. 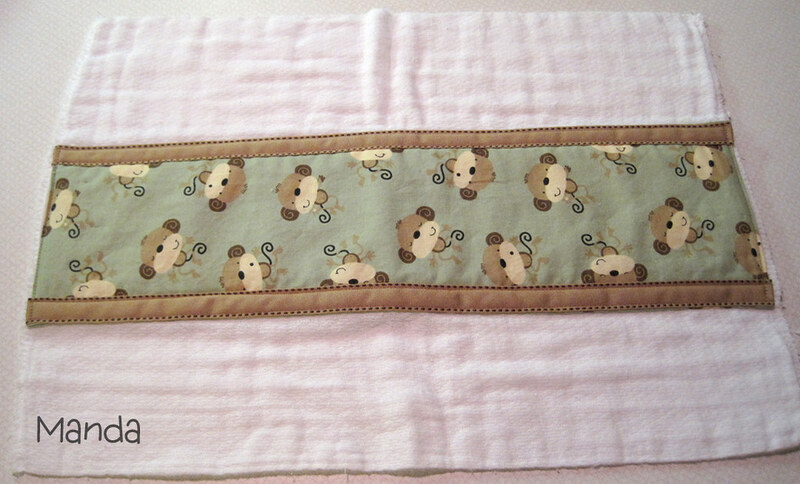 At the end, keep your needle down, lift your pressure foot, and then turn the burp cloth so you can sew the end. Do the same at each corner until you have sewn all four sides. Make sure you back stitch at the beginning and end. That’s it! Here’s what mine looked like when I was done sewing. Have fun making burp cloths! 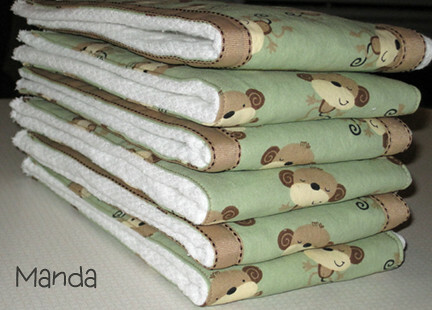 A short stack would make a great baby gift! These are adorable! I totally need to make some for my little girl who is coming in March. 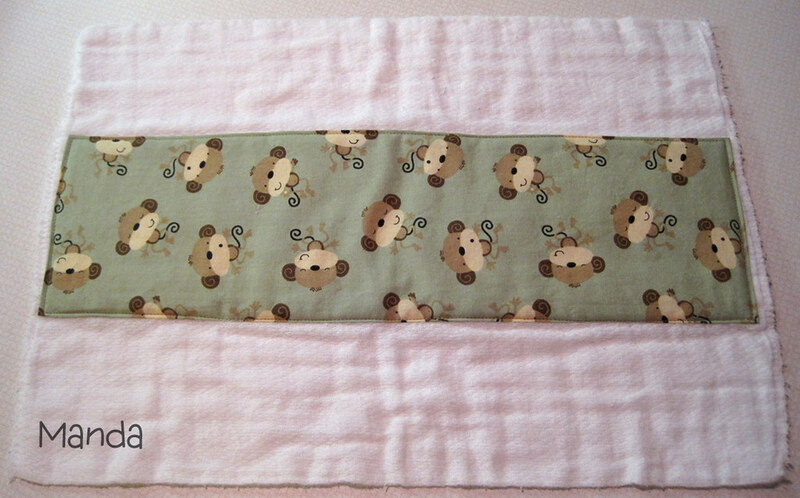 I have made tons of flannel burp cloths in the past, but I have never used cloth diapers as a base. What a cute idea! Congratulations! I’m making some more burp cloths as a baby gift and I was going to use flannel for the center this time. They really are super easy to make!